Can New Tech Outsmart Status Quo? This month, I encourage the readers of Pharmaceutical Executiveto read the December issue of our sister publication, Applied Clinical Trials. 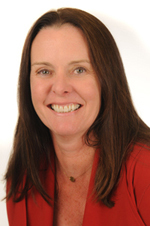 The issue focuses on technology and clinical trials software (eClinical), with an eye on where the clinical trials data collection process may have gone awry, may have caused inadvertent complications in the clinical trials process, but still with optimism on how future technologies Lisa Henderson can improve all aspects of drug development. Recent surveys, along with Levy’s anecdotal information, report an explosion in the number of clinical data sources, with EDC comprising only 20% to 30% of clinical data, along with ePRO, mHealth, lab data, and more—leaving CDMS trying to catch up in a decentralized and not-well-integrated landscape. Connelly continues with the fact that biopharma of all sizes take large risks and spend millions to billions of dollars on R&D for new and better treatments. And maybe spending resources on innovation and management of clinical trials would be well spent. In January’s issue of Pharm Exec, we will take a look at the trends that will impact the C-suite in 2019. We don’t discuss clinical trials but we do look at technology, specifically uses of AI that are currently in practice and ones that could easily be adapted to the pharma model. Sanjiv Sharma, VP, North America commercial operations, HLS Therapeutics, and Pharm Exec Editorial Advisory Board (EAB) member, believes that AI is going to creep up faster than we think. “The permutations of AI, and adding in real-world evidence, will have impact on the drug and diagnostic areas for the next four to five years,” he says. John Furey, chief operating officer, Spark Therapeutics, and also an EAB member, agreed that AI is already being used to find patients as well as in determining the prospective care of patients. EAB member Jay Galeota, president and COO, G&W Laboratories, says that hospital systems are using phenotypic screening to determine high-responders for certain drugs so they can make P&T decisions based on these algorithms. In many industries, it appears that technology and innovation is far surpassing individuals’ and companies’ ability to change course and adapt to the changes. 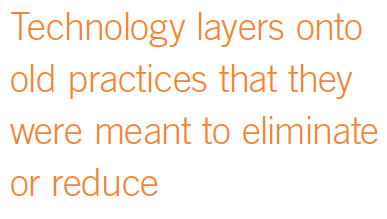 Technology layers onto old practices that they were meant to eliminate or reduce. Technology that was meant to make efficient use of resources that then generates its own inefficient department. As in the cases cited by our EAB members, intelligent uses of technology are being implemented and will—gradually or extremely quickly—break down the status quo. I was going to close with a comparison of protecting your archaic model vs. creating new models with a not-kind comparison to Comcast and its lack of transparency for its services and prices listed on its website. However, I have to travel overseas and call them when I get back, probably devoting one-third of my day to their sales team. Wish me luck as I try to bridge the new world of technology with the tried and true status quo.